GOLD coins are generally abbreviated as "AU" or even "AV". 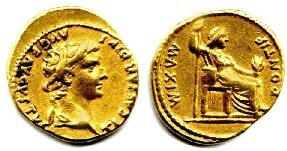 The main gold roman denomination was the aureus. Constantine replaced this with the solidus. Other gold denominations were the semissis, the scripulum and later the tremissis. Constantine introduced a new gold coin in his reign, to replace the aureus, which was called the solidus and was 1/72 of a pound. This was another gold denomination introduced by Constantine, worth one and a half times that of a solidus. The semissis was a smaller gold coin introduced by Constantine, and was worth half of a solidus. It was replaced in the reign of Theodosius I. The tremissis was introduced by Theodosius I to replace Constantine's scripulum, and was worth a third of a solidus. SILVER coins are generally abbreviated as "AR". The main silver roman denomination was the denarius. This coin lasted until the mid third century AD, when it was gradually replaced by the antoninianus. Later Roman empire silver coins were the argenteus, siliqua, and miliarense. The denarius was the main silver coin, in fact the main denomination, of the Roman Republic. Under the Empire, Augustus controlled the minting of the gold and silver denominations, and the denarius continued. Under Nero the weight and fineness of the denarius dropped, and this cost-cutting practice was continued under successive emperor. By the reign of Caracalla, the denarius was about 40% silver, and the new antoninianus was introduced. The denarius continued, but was gradually phased out, first becoming bronze, and then disappearing after serving the Romans for almost 400 years. Silver quinarii, or half denarii, were minted sporadically throughout the Republic. Its minting became more regular under the Early Principate and, under Augustus, it was worth 8 asses. This coin was introduced by Caracalla and worth twice that of the Denarius, but it actually only had about one and half that of the denarius's silver content. Both the Antoninianus and the denarius continued for some time until the denarius was phased out. Gradually, over the Third Century, the silver content of the antoninianus dropped, until it was merely silver washed bronze coins. At this time, it is considered to be an AE coin. This silver coin was first minted by Diocletian as part of his monetary reforms. It lasted until the reign of Constantine and replaced the old denarius, for it was roughly the same fineness and weight of the early denarius. This silver coin was worth 1/18 of a solidus, and was introduced by Constantine late in his reign to replace the argenteus. Another silver coin introduced by Constantine, and worth 1/24 of a solidus. Originally it was 1/96 of a pound of silver, but his son, Constantius II reduced it to 1/144 of a pound of silver. AE coins, ie those coins abbreviated as "AE", are generally made of base metals, such as Bronze (an alloy of tin and copper), copper (a reddish metal) or orichalcum (a yellowish metal). The main bronze denominations of the early empire were the sestertius, the dupondius (orichalcum) and the as (Copper). 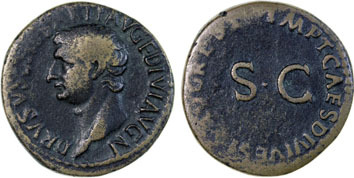 Bronze coins in these days were usually issued by the Senate, and had SC (Senatus Consulto) on the reverse. Later both the denarius and the antoninianus lost their silvering and became bronze coins. The Later Roman Empire has the folles as its' main bronze coin, but there was also the centenionalis and numerous other nameless denominations now known as "AE"s.
The orichalcum sestertius (plural: sestertii) was the largest bronze denomination in the early Roman Empire, and it continued, growing only gradually smaller until the reign of Postumus (usurper in the breakaway Gallic Empire, AD 259-258) who minted the last sestertius. Because of their larger flan, the sestertii, particularly of the earlier empire, had the potential for exquisite reverses which many moneyers, particularly under the Adoptive and Antonine dynasties, used to portray their finest works. The copper quadrans (plural: quadrantes) was worth a quarter of an as under Augustus. It was one of the smallest denominations in the Early Principate. 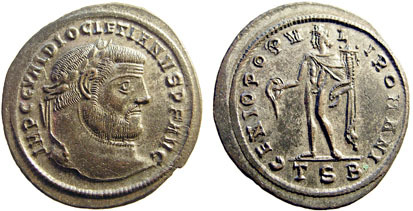 The bronze follis (plural: folles), originally silver washed, was a new denomination of Diocletian's monetary reforms. The follis, however, soon began to decline in diameter and weight. The follis then mingled into the AE category (below) as the size of bronze coins fluctuated radically. The example to the left is an earlier (therefore larger) version of the Follis. The bronze centenionalis were the attempts of Constans and Constantius II to reintroduce a large bronze coin, as the follis (above) had by then shrunk dramatically. The centionalis, however, did not last long and by the end of Theodosius the Great only smaller varieties of bronze coins were minted. The bronze coinage of the later Roman Empire has too many varieties in diameter and weight. No record is known of the names of these denominations, or their worth. They are broadly categorised as AE1 (27mm or larger in diameter), AE2 (23 to 27mm), AE3 (17 to 23mm) and AE4 (less than 17mm).